Anti Drill and Anti Saw Hardened Steel front cover - superbly finished. Interchangeable Pick Resistant Seven Lever Lock for total security. If your property has a side or rear gate, how secure is it? Are your garden locks adequate? It is not enough to fit a cheap garden lock, a hasp and staple garden lock, or gate bolt with a padlock, as it is far too easily broken. 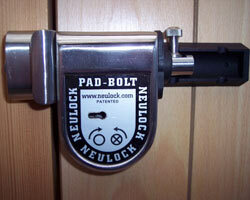 Replace the old bolt locks and padlocks on your gates and significantly improve the security of your property.